This novella is the first of a new series based on a group of children from the Children’s Aid Society, a New York orphanage who travel on an orphan train to Texas. Each story will feature some of the children and what happens to them as children and adults, while throwing a little sweet and inspirational romance into the mix. In this first story, Craig Parker,a local farmer, has been asking widowed Amanda Drake for over a year to marry him, to which Amanda has refused each time. They hear about a train full of orphans coming to their town in Texas and both want to adopt a child as a single parent. When meeting with the Town Council, they are both individually given permission to adopt. Complications arise as Amanda must make a decision that will affect her future and the future of her crippled adopted daughter. Will a marriage of convenience to Craig be the right step to take or should she stay single and raise her daughter on her own? 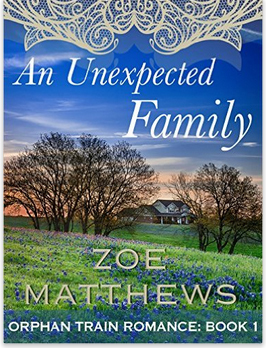 Will she find an unexpected family?